Don't tell me to stay where I am, my brother is in your "emergency situation!" The nerves that come with launching a new #1 must keep even seasoned pro's awake at night. 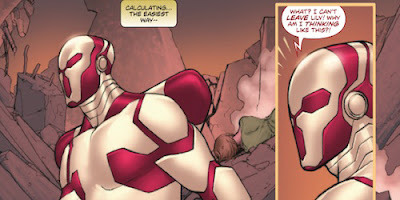 The nerves that come from launching a new #1 that also launches a new high-profile sub-universe for a publisher, and carries the brand of a living legend must be a whole other ball game, on a whole other planet, in a whole other whole other. Luckily for BOOM! Studios then, writer Paul Cornell has 'whole other' and then some, right in his back pocket with Soldier Zero #1. Sure issue two is already on the shelves, but this book is my money shot for the month. As an alien warsuit battles across the universe against it's pursuers, Stewart Trautmann, an ex-Afghanistan war US soldier, has to deal with getting on with life from the point of view of a wheelchair, and the over-bearing good-hearted nature of a brother who would rather celebrate him as an "American hero", rather than as the pacifist he is at heart. 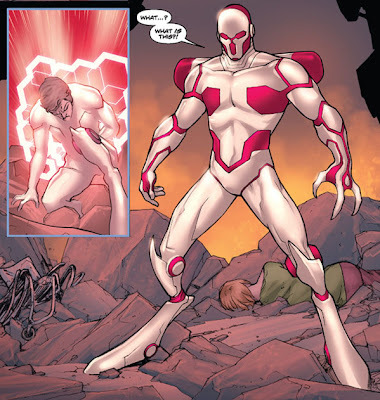 As the paralysed warsuit crashes to earth, among the debris of its drop-zone it finds Stewart and bonds with his body, to create for itself a new 100% mobile host, in the form of Soldier Zero. It's a good clean debut issue that combines the best aspects of the comics' past, in a modern and exciting way. While it's hard to tell what Stan Lee (who is credited as "Grand Poobah") provided, everyone on this book, and I mean everyone, rose to the occasion. 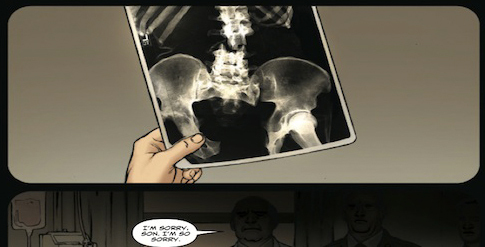 Paul sets up the supporting cast and perspective of Stewart, attaching him to the reader. Alfred Rockefeller is outstanding on Crayola duty. Javier Pina cleanly and expressively illustrates, and Ed Bukeshire ties it all together with clear work on the A-B-C's. Polishing off this interplanetary union, is the book's design. 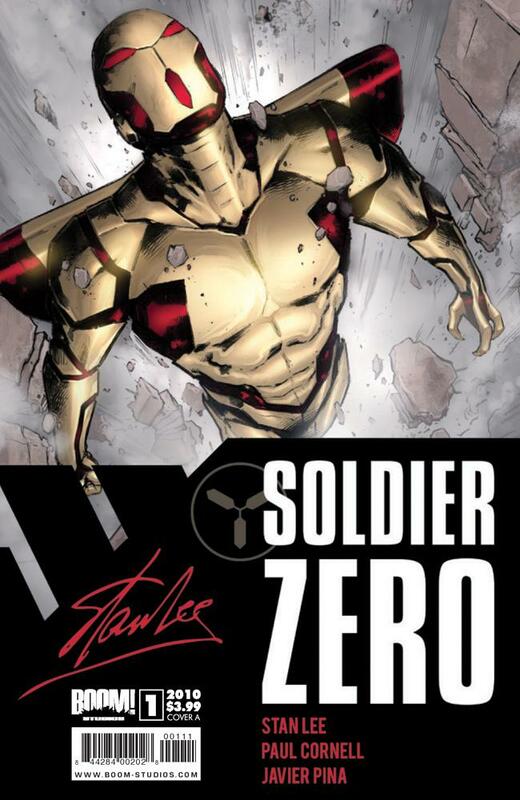 Sure the cover trade-dress will be shared by all the Stan Lee/BOOM!-verse-ians, but Soldier Zero has an extra ace up his sleeve in that his warsuit was designed by 100 Bullets cover artist Dave Johnson - and boy that man's awesome switch is never turned 'off'. With the mask an instant icon, I especially love the feet. More like powerful running springs, they combine with the three-fingered hands to tell you just at a glance, this is not something any human came up with, but his adventures will be something all of them can enjoy.